I love this bedding!! The color is a little deeper than the picture in the ad but still so nice. I didn’t give it 5 stars only because they didn’t offer the throw pillows. I was able to find some that matched well though. I ordered the king for my queen bed, it’s perfect. 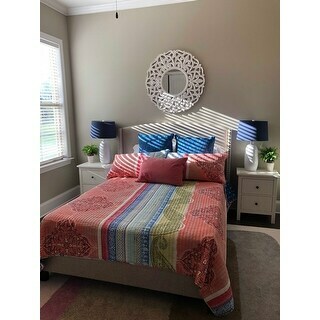 My guest room is complete!! 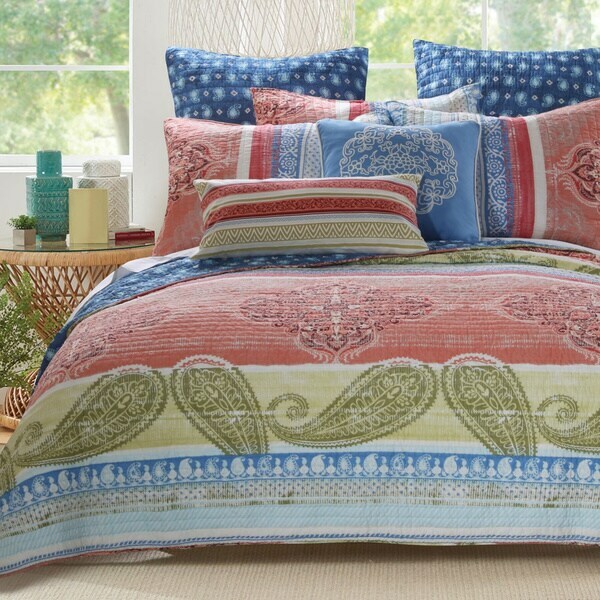 The Hillsborough Coral 3-piece quilt set from Barefoot Bungalow features decorative medallions and a paisley print to complement your bedroom's boho chic style. The quilt is constructed with a microfiber polyester face and cotton back that is perfect for year round use. Very pretty ensemble...beautiful colors. It's not 100% cotton unfortunately, so I layered it over a white 100% cotton quilt...perfect & beautiful. Recommended! I love this quilt! The colors are beautiful and it's so soft. It's a great weight. Very please with my purchase. I love my Quilt set gave my a different look, my family loves the new bedding and it fits my Queen size bed perfect, not to heavy just right. This set is perfect for south Florida I found the soft colors to be bright and tropical. They feel so boho and yet at the same time are suitable for a country cottage or even a contemporary loft. It is well made and the fabric is so soft . Not true to its colors, PINK here is more like Fluorosent pink. But looks beautiful. Very soft and perfect for Summers. Little expensive for a King size... but then looking at its utility over a period of years, I will not bother much. Don't love it, like it a lot. I wish that the decorative pillows in the photo were available. I read a review stating that the color was fluorescent pink, after I purchased it. The pink is exactly as pictured. I love the multi colors of this spread. 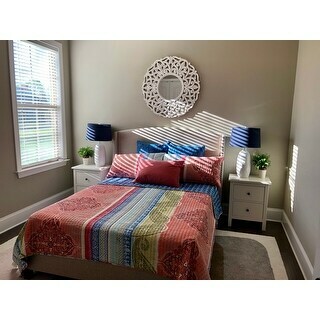 It brightens my room and gives a cozy feeling to any decor. Very pretty. Really brightens up the bedroom. Was in no way disappointed. "Where can I get the euro shams for the barefoot bungalow hillsborough coral quilt set?"